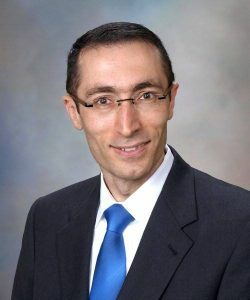 Seeing is believing – that saying is especially true for Fadi Shamoun, M.D., a consultant and assistant professor in the Department of Cardiovascular Diseases at Mayo Clinic’s campus in Arizona. Dr. Shamoun was aware of the potential value of pharmacogenomics testing, which examines how a patient’s genetic makeup could impact the way he or she processes medications. But he became a true believer once he saw results from his own pharmacogenomics test. “I knew that pharmacogenomics tests were used to help physicians select the right drug and right dose for patients. But I was still skeptical. However, I had an ‘aha moment’ when I saw my own test results revealed a sensitivity to Warfarin, a blood thinning medication used for patients with heart disease. As a cardiologist, I deal with this drug every day but never knew how it might affect me. I learned if I ever take this drug, my dosage would need to be adjusted to avoid side effects such as severe bleeding. I am now a true believer in the importance of pharmacogenomics,” says Dr. Shamoun. Dr. Shamoun is a pharmacogenomics champion for Mayo Clinic Center for Individualized Medicine Pharmacogenomics Program. In this role, he talks with physicians and patients about the advantages of this testing tool. “I chose to get tested to experience firsthand how genetic results impact medical care decisions. My own story has become a powerful testimonial to the importance of using genomic information to individualize care for patients,” says Dr. Shamoun. Based on his own experience, Dr. Shamoun believes that pharmacogenomics testing will play a growing role in guiding medication decisions. “In my own practice, I recommend pharmacogenomics testing for patients who have a complex medical history, are on multiple medications or have had severe reactions to medications in the past. Many patients who get tested are relieved to discover that there is a reason that they have experienced side effects from medications. They are also grateful to have information that can guide future decisions about drug therapy throughout their lifetime,” he says. In sharing his story with other physicians, Dr. Shamoun is seeing pharmacogenomics embraced as a critical tool in many medical specialties.